A few years ago I posted a tips and tricks guide for Fire HD and HDX tablets, but a lot has changed since then, especially since Amazon upgraded to Fire OS 5, so I’ve gone through and updated the list to apply to the new 7th generation Fire HD 8 and 7-inch Fire tablets for 2017. These tips also apply to the previous generation models with Fire OS 5.0 and up, including the Fire HD 6 and HD 10 tablets. 1. Fire Tablets Help and Support Section – Here’s the help section at Amazon with all the Fire tablet support articles for everything from getting started tips, quick fixes, initial setup, troubleshooting, setting up parental controls, how to use the accessibility features, and a lot more. 2. User Guides – All the newer Fire tablets come with the user manuals built-in. To access the user guide, swipe down from the top of the screen and tap Help > User Guide. Help videos are accessible from there as well, along with a troubleshooting guide for common problems. 3. Contact Amazon Support – The two tips above both provide options to contact Amazon support for assistance; you can even send an email directly from the Fire tablet’s help section. Beware of phony Amazon support numbers posted all over online. 4. Remove Ads – After logging into your Amazon account, go to the Manage Your Devices section of your account. From the actions list you can choose to "Edit" the Special Offers field to unsubscribe from ads. It costs $15 plus tax. 5. MicroSD Cards – The latest Fire tablets support microSD cards up to 256GB in size. You can install apps on the memory card, and store Amazon music, videos, books, audiobooks and more on the memory card. See here for the Fire Tablets MicroSD Card How To Guide. 6. Check Available Storage Space – Go to Settings > Storage. From there you can choose to free up space by archiving Amazon content not recently used, and view what type of content is using the storage space to choose specific items to remove. 7. Parental Controls – In the settings menu there’s an option for parental controls where you can setup a password to restrict purchasing content, using the web browser, accessing certain apps, blocking Alexa, and more. You can also setup child profiles and Household profiles to share content (#26). 8. Password Protection – In Settings > Security there’s an option to set a lock screen password so that other people cannot access your device. 9. Backup and Restore – You can backup all your device settings, installed apps and more from the settings menu under device options. Backups can be used to restore a factory reset tablet or even a new one. 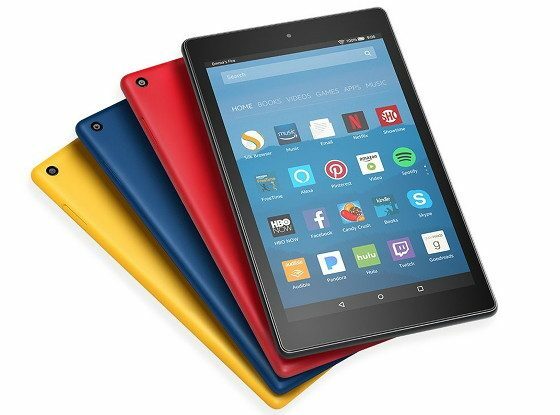 See here for more about How to Backup, Restore and Factory Reset Amazon Fire Tablets. 10. Change Name – You can change the name that appears in the upper left corner by going to Settings > Device Options > Change Your Device Name. 11. Install Google Play – All Fire tablets that run Fire OS 5.0 and up can have the Google Play Store installed easily in about 5 minutes, no hacking or rooting required. You just have to install four Google apps. See here for directions on how to install Google Play on Fire tablets. 12. How to Take Screenshots – To capture screenshots press and hold the power button and the volume down button at the same time for 2 seconds. 13. Adjust System Font Size – You can increase the font size for all the menus and items by going to Settings > Display > Font Size. 14. Blue Shade – From the quick settings menu you can turn the Blue Shade feature on and off to filter out blue light to help with night reading. Tap the notification to configure settings (or go to Settings > Display > Blue Shade) to fine tune brightness and color and set it to automatically turn on and off at specific times. 15. Using Alexa – Amazon’s virtual assistant app can be activated by holding the home button until a blue line appears. You can use Alexa to ask questions, shop at Amazon, run searches, play music, and more. Alexa can be turned off by going to Settings > Device Options > Alexa. 16. Adaptive Brightness – The Fire HD 8 has a feature called adaptive brightness that automatically adjusts the screen brightness based on the amount of ambient lighting. It can be very distracting but luckily it can be turned on and off in the Settings menu under Display. 17. Homescreen Settings – Go to Settings > Apps & Games > Amazon Application Settings > Home Screen Settings to turn on and off homescreen recommendations and new items appearing. You can choose to show apps on the recent page or not, and make it so scrolling is smoother on the homescreen. 18. Print From Fire Tablet – If you have a wireless printer you can print from a Fire tablet. See here for more about How to Print from Fire Tablets. 19. Install 3rd Party Android Apps – You can install apps that aren’t from the Amazon appstore by going to Settings > Security and enabling "Apps from Unknown sources". 20. Alternate Appstores – After enabling 3rd party apps as described above, you can install apps from anywhere you can get them. Here’s a list on some alternate appstores or you can install Google Play (#11). 22. Reboot – If your Fire tablet is ever experiencing problems, you’d be surprised how often a simple reboot fixes most issues. 23. File Manager – Fire tablets don’t come with a good file management app and it can really help to have one. Luckily there are some file manager apps at Amazon, some are free. 24. Alternate Homescreen – You can install alternate homescreen launchers to get access to a more common Android-style homescreen. However, the home button doesn’t map to the new launcher so you have to use the app icon or recent apps list to get to the alternate homescreen, and widgets don’t work properly either. 25. Change Wallpaper – Go to Settings > Display > Wallpaper to change the wallpaper. You can use custom images too. 26. Family Sharing and Child Profiles – You can create up to 4 child profiles on Fire tablets and choose what content is available for each. You can also setup Family Library sharing between two Amazon accounts to share ebooks to other content like apps, games, audiobooks, and Prime Instant Videos. See this article for details on how to setup profiles and Family Library sharing. 27. Find Your Tablet – Amazon offers a few options to help find a lost or stolen Fire tablet, including remote alarms and tracking. You can also set a password or factory reset remotely. Here’s an article with more info. 28. Second Screen – Unfortunately Fire tablets don’t have a way to stream or cast content on TVs, but there’s a second screen feature that works in conjunction with Amazon TV devices to use the tablet as a remote and to use the X-ray for movies feature to learn more about the show. 29. Turn Off App Notifications – Sometimes apps can get annoying with pestering notifications. Luckily there’s the option to turn off notifications for most apps in Settings > Sound & Notifications > App Notifications. You can also setup times to mute all notifications, or select Do Not Disturb from the quick settings menu. 30. PDF Reader Apps – If the Kindle’s PDF app isn’t cutting it, there are much better options out there. In the Amazon appstore there’s Adobe Reader, which is free. Foxit is one the best free apps for PDFs but it won’t install from the Amazon appstore. 31. App unresponsive or not working properly – Apps can sometimes freeze up or start acting slow or unusual. Re-starting the device will often make an app that is misbehaving start working again, but a quicker way is to force close the app. Go to Settings > Apps & Games > Manage All Applications > Select App > Force Stop. If that doesn’t work trying clearing cache and data as well. The last option would be to try uninstalling the app and then reinstalling it. 32. Folders – You can create folders on the homescreen to group apps together simply by holding and dragging an app on top of another app. You can name the folder or leave it blank. 33. Battery Monitoring App – A good way to monitor battery usage and to see which apps are using the most power is with GSam Battery Monitor. 34. Silk Web Reader – The Silk web browser has a feature that takes the content of a page and cleanly re-formats it. There are different text sizes and formatting options. Look for the book icon located on the web browser tab. It only appears on article-type pages. 35. Save Web Pages – With the Silk web browser you can save pages (like this one) for future reference and offline reading by hitting the menu button, then tapping the Reading List icon and selecting "Save to Reading List". 36. Cloud Storage – In addition to Amazon’s cloud drive, you can use other cloud storage options to easily save, stream, share, and move files. One popular options that works well with Fire tablets is Dropbox. It’s not available in the Amazon appstore but the apk file can be emailed or texted from the link above. 37. Uploading Music – You can upload your personal music collection to Amazon’s cloud drive and stream it or download it to your tablet. Here are the directions for uploading music. The first 250 songs are free to upload. 38. Loading non-Amazon eBooks and Personal Documents – The fastest and easiest way to load non-Amazon ebooks and personal documents on to your Fire tablet is to use a send to Kindle application or email them to the Kindle Fire’s free email address. The unique address can be found under Settings > My Account, and can be modified from the Manage Your Devices page at Amazon. 39. Select Text & Copy and Paste – When using the web browser and certain other apps, you can select and copy text by long-pressing on the word and then dragging the little arrows. To paste, long-press in any text entry field to bring up the option. You can also long-press on links and images with the browser to bring up saving, sharing, and other options. 40. Text to Speech Voices – You can change the voices that are used for the text-to-speech feature by going to Settings > Keyboard and Language > Text-to-Speech. Then make sure to turn on TTS from the reading settings menu using the Kindle app. 41. How to Read ePub eBooks – There are a number of ePub reading apps available in the Amazon appstore but Amazon hides most of them from appearing on Fire tablets, except for OverDrive. It’s a good option for ePub books in addition to library books. 42. Access a Computer Remotely– You can access your computer and all the files and programs on it directly from your Kindle Fire with the Splashtop Remote Android app. 43. Fire Tablet Accessories – Here’s the page at Amazon for list of accessories for each Fire tablet model. 44. Advanced Fire Tablet Guides – Head over to the XDA forums for some advanced tips and tricks for Fire tablets, everything from hacking to rooting and installing custom ROMS (more for previous generation models than newer ones). 45. Free Whispersync for Voice Audiobooks – Each month Amazon gives away a free ebook and audiobook pair to promote their Whispersync for Voice feature that syncs ebooks and audiobooks together to switch back and forth between reading and listening. The freebie gets updated on the Whispersync for Voice page each month. 46. Free Library eBooks – Fire tablets support getting library ebooks downloaded for free from local libraries. You can use the Kindle option or install the OverDrive Android app. 47. Free eMagazines – Many public libraries offer hundreds of popular digital magazines for free. The free magazines can be downloaded once sideloading the Zinio app and are totally free and have no return dates; you can even download back issues. 48. Free Android Apps – Amazon discontinued their underground appstore with the 7th gen tablets but you can still find plenty of free Android apps. The sound on my tablet 8 is no very loud and my music has not been transferred from my kindle 7. FWIW, I’ve found the Amazon launcher less and less irritating the more that I’ve used it BUT there IS an alternative launcher that works very well and is (essentially) free. It’s available in the Amazon store (and Google Play Store) called Smart Taskbar 2. What it does is place a translucent button on the screen – always available regardless of what app is active — that pops up a screen which has a customizable bar across the top (sort of like standard Android) and a scrollable list of all apps. It also allows customizable tabs through which you can groups apps by any means you wish. It works very, very well. It also works with other Android devices. Thanks. I just received my Amazon HD 10″ Fire Tablet (2017) yesterday. I upgraded from the 7″ Fire Tzblet (2015) and I love this one. Your tips are very helpful. I’ll save this page also. Any tips on how to transfer bookmarks from a PC to Fire? thanks for sharing.. I upgraded from the 7 Fire Tablet and I love this one. Once I download Apps from Playstore, where can I find them? Some not going to home screen? My fire does not give me option to CONNECT to wifi while in a free wifi zone? The connect button is grayed out??? I have a 2017 fire HD 10″. when I push the square button at bottom, it shows my cache. but I do not see any place to delete them all like I can on my phone. I have to manually delete each one. Am I missing something? I just want a search button for my documents folder. Where is that? What is the best texting app for 2017 – Kindle Fire HD 10″ (Seventh Generation)?